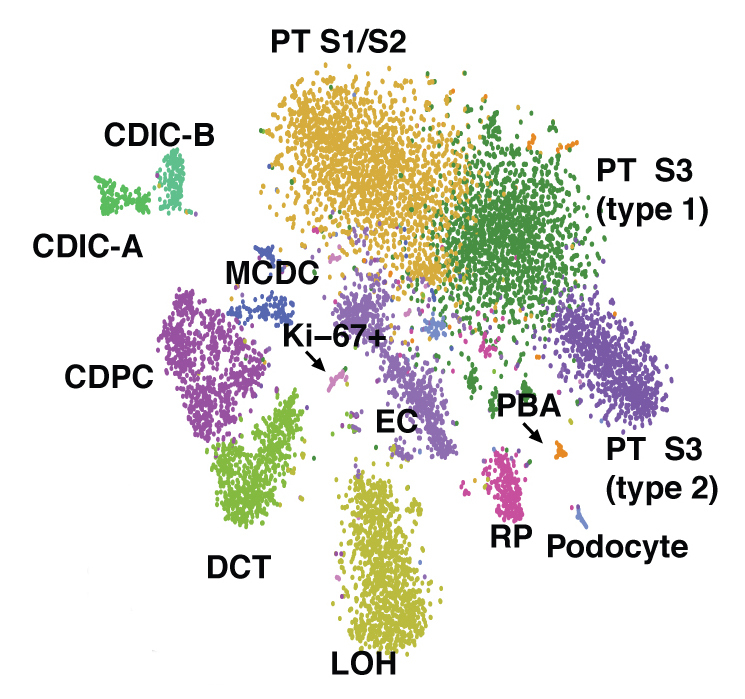 Color chart: Merging gene expression and DNA-packaging data reveals 14 cell types in a mouse kidney. A new technique reveals the active genes and the regions that regulate them in thousands of single cells at once1. The method involves combining two existing techniques and dramatically scaling them up. A cell’s function is determined by which of its genes are active. To identify these genes, scientists often sequence the messenger RNA that serves as the readout for a gene’s instructions. But that does not reveal anything about how the genes are regulated. DNA coils around proteins to form a structure called chromatin. Chromatin’s shape exposes some DNA regions to the cellular machinery that transcribes them, and it hides others. This landscape of ‘open’ and ‘closed’ chromatin reveals not only which genes are active, but also which genes control which others. Scientists have isolated single cells and studied chromatin shape or RNA sequences from one cell at a time. In the new assay, the researchers generate both chromatin and messenger RNA profiles for tens of thousands of cells at once. The researchers first distribute single cells into separate compartments, or ‘wells.’ They then add a unique tag to each well that attaches to all the RNA in that well. They also fragment the DNA and tag all the chromatin with a DNA code specific to that well. They break open the cells, combine the DNA, RNA and chromatin from all the wells and sequence the mixture. The unique tags on the RNA and chromatin fragments identify the cell they came from, enabling the researchers to match the RNA results with chromatin analysis for each cell. The researchers tested their approach on 11,296 kidney cells from two mice. They identified 14 kidney cell types based on gene activity patterns. They looked more closely at 2,000 genes that showed the greatest differences in activity across the cell types. Based on whether the chromatin for those genes is open or closed, they linked 1,260 regulatory regions to 321 genes. Some of these links were previously unknown. And all of these regions are far away from the genes in the linear DNA sequence. The approach can quickly reveal connections between distant parts of the genome, the researchers reported in August in Science. Scientists could modify the method to combine gene activity with the chemical modifications to DNA that dial gene expression up or down.